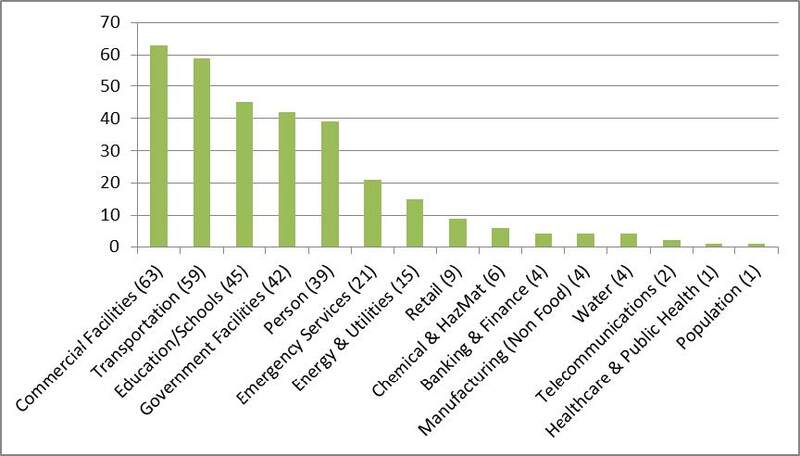 • Of the 315 reported incidents, federal law enforcement agencies pursued 113 leads (36%). 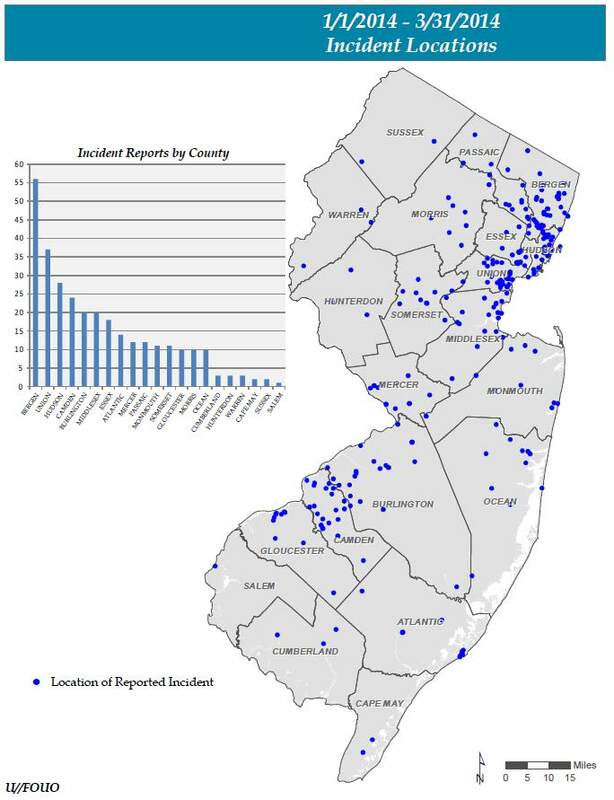 • The three counties with the highest number of incidents in NJSARS during this period were Bergen, Union and Hudson. 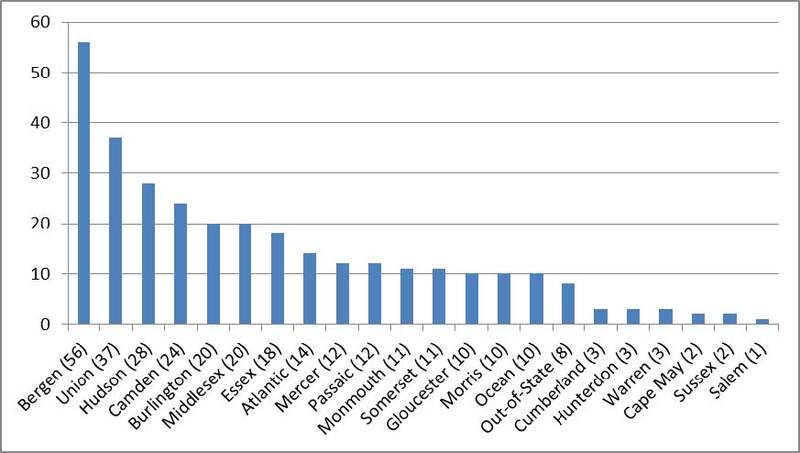 They were followed by Camden, Burlington and Middlesex counties. • The most frequently reported type of incident in NJSARS during this period was suspicious persons, categorized as expressed or implied threats and material acquisition, followed by lost/stolen IDs and bomb threats. • By sector, the highest number of incidents in NJSARS during this period was Commercial followed by Transportation and Education/Schools. 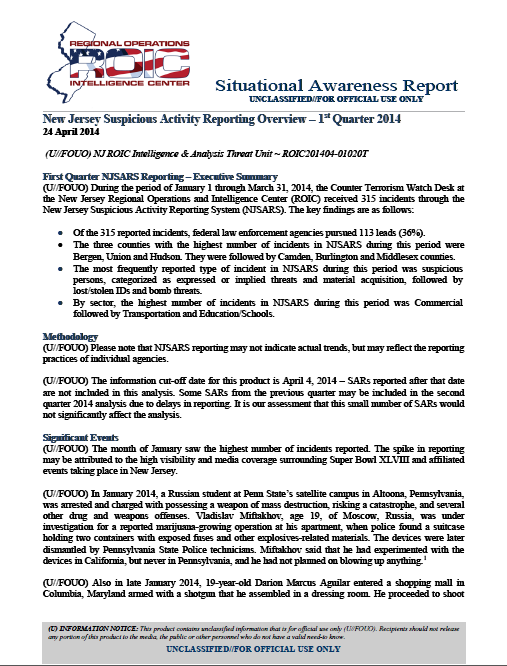 (U//FOUO) Please note that NJSARS reporting may not indicate actual trends, but may reflect the reporting practices of individual agencies. (U//FOUO) The information cut-off date for this product is April 4, 2014 – SARs reported after that date are not included in this analysis. Some SARs from the previous quarter may be included in the second quarter 2014 analysis due to delays in reporting. It is our assessment that this small number of SARs would not significantly affect the analysis. 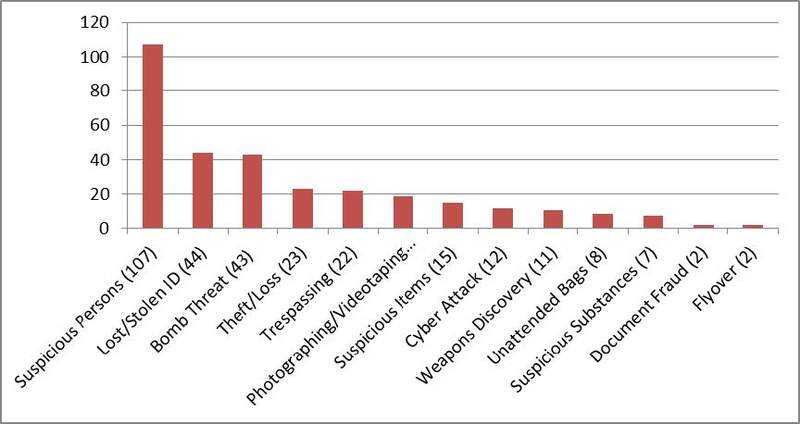 (U//FOUO) The month of January saw the highest number of incidents reported. The spike in reporting may be attributed to the high visibility and media coverage surrounding Super Bowl XLVIII and affiliated events taking place in New Jersey. (U//FOUO) In January 2014, a Russian student at Penn State’s satellite campus in Altoona, Pennsylvania, was arrested and charged with possessing a weapon of mass destruction, risking a catastrophe, and several other drug and weapons offenses. Vladislav Miftakhov, age 19, of Moscow, Russia, was under investigation for a reported marijuana-growing operation at his apartment, when police found a suitcase holding two containers with exposed fuses and other explosives-related materials. The devices were later dismantled by Pennsylvania State Police technicians. Miftakhov said that he had experimented with the devices in California, but never in Pennsylvania, and he had not planned on blowing up anything. (U//FOUO) Also in late January 2014, 19-year-old Darion Marcus Aguilar entered a shopping mall in Columbia, Maryland armed with a shotgun that he assembled in a dressing room. He proceeded to shoot and kill two employees at random then stepped out of the store, fired several more shots, and injured five additional victims before committing suicide. In addition, further investigation revealed crude explosive devices were found in his bag. In March, Howard County Police confirmed that Aguilar had no connection to his victims and modeled his attack after the Columbine High School shooting.